you know i made treats. and activate all the expert interwoven forms and functions. 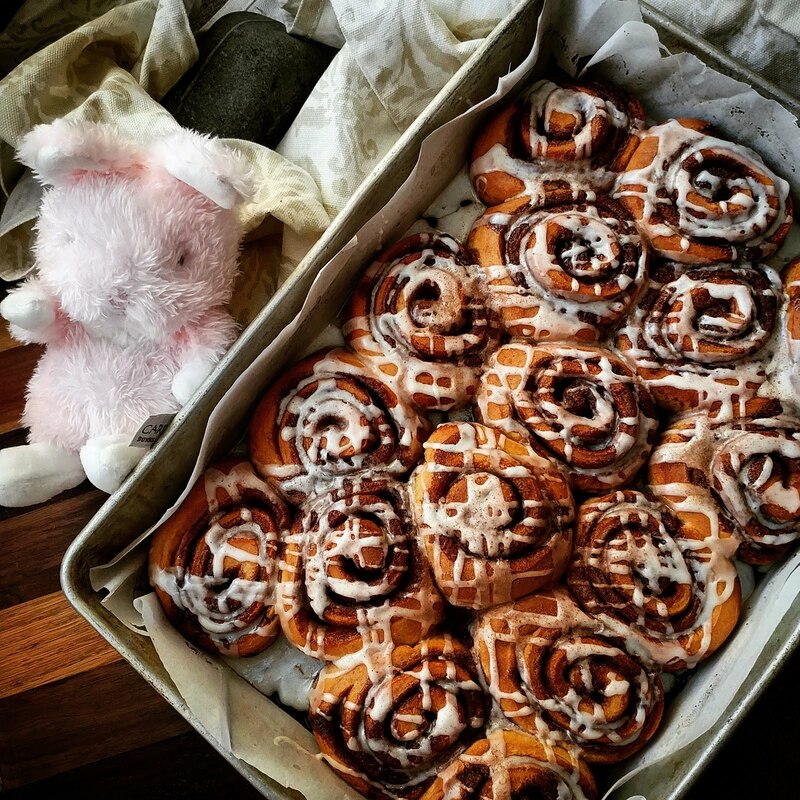 on the first of the month, we make treats. although i often eat enough for a crowd. and this was no exception, although they were exceptional. that's my favorite way to begin the month, man. with exxxtra icing and cinnamon sprankles. i have not been making these all these years in the hopes that they'd get WORSE. and they get better and better and better. better is what i'm on about, brothers and sisters. sixteen of 'em this time. in fact, too much is the right amount, so more is mandatory. for all of y'all who want your very own batch of from-scratch fresh-to-deathness. warm up 1 cup of s'milk, with 1 tsp vanilla, and half a stick (4 T) vegan butter. knead it up for 11 minutes until it's a firm shiny ball of elastic dough. good dough gets me psyched. meanwhile, line a 9" x 12" pan with parchment. and evenly spread the filling to one long and both short edges. and make sure the seam is underneath the resultant log. before i baked them for about half an hour. nothing is precise around here, but the results are usually great anyway. how much sugar is in these? SO much. i already told you: too much is the right amount. a cup of powdered sugar, a splash of vanilla, a few tablespoons of s'milk. and a few shakes of cinnamon after just to be sure y'all understand how i'm livin'. i ate seven of 'em myself. i know... that's effed up. they're too good not to go all out on, though, bro. we're all gonna be ok.
i'll be waiting for some showers. they take about half the month to materialize. we're more likely to get one more snow storm before we're done with winter's touch. april is a wild one. but for two more months, you just shiver a little bit all the time. that's the woodsly goodness, where tough folks live hard lives. filling up the time in between bursts of family time and concentrated affection. none of it is easy, but that's not the point, it seems. making the most of What Is, and making that matter more. that's the best we've got. i am grateful for the people who let me be a part of their lives. i'm grateful for the daily doings of my determination. mostly, i've got gratitude for the bright spots that make it worth a damn.